Login Failure report provides information on the number of failed login attempts and the reasons for failure over a period. Multiple Login Failure attempts (bad login attempts) on user accounts in the selected period is reported. This equips Administrators with information on possible attacks on "intruder attack susceptible" accounts. Information on login failure like, when a login failure occurred, login failed account, and possible failure reasons is reported. 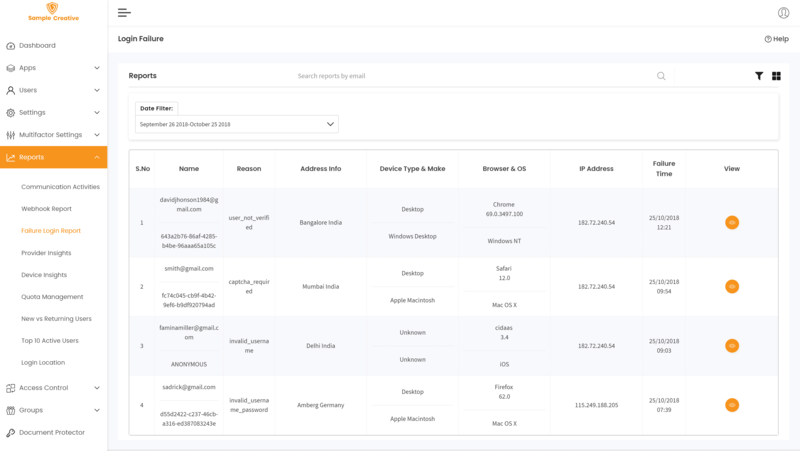 The report can be filtered using parameters such as the location, the device, the browser and OS of the source. Login Failure Reasons could be critical like a wrong user name, wrong/bad password which are susceptible to attacks. Reasons which require Administrator attention for e.g. - "Account disabled/expired”.